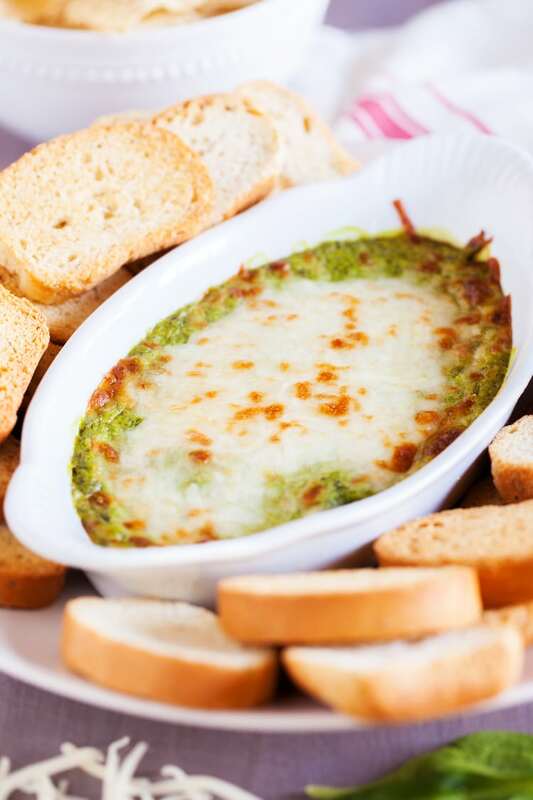 This Baked Spinach Artichoke Dip is a must have for any party, it’s loaded with cheese and garlic and the recipe has two different prep methods, you can make it either hearty or creamy! Warm, Creamy, Cheesy. 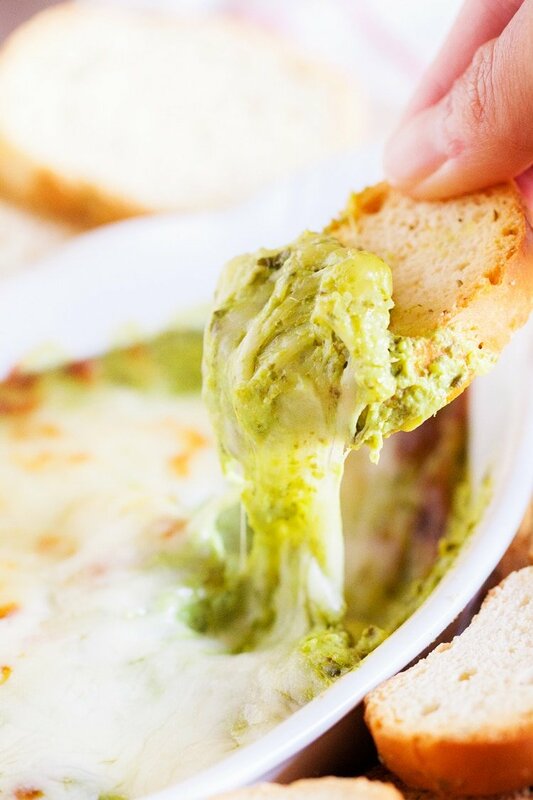 This Baked Spinach and Artichoke Dip is an easy and flavorful recipe that’s a huge crowd pleaser! It’s the perfect addition to any party and with the Super Bowl right around the corner, it’s a must-have appetizer. Your guest will love the hearty artichokes and spinach with creamy cheeses and let’s not forget the garlic! I’ve made this dip several times and with two different prep methods. There’s a hearty version and a creamy version, both delicious but the creamy version is a little quicker and easier to make as you just throw everything in the blender! Both taste great, it just depends on what you like! My family also prefers the Parmesan and Asiago version as it’s a bit saltier than the milk swiss version, which is still delicious. Again, it’s all about preference. Feel free to experiment with the cheeses and figure out which blends you like best! This makes a pretty large serving so it’s perfect for a large group of friends and family. What Do You Serve Spinach Artichoke Dip With? Substitute your Swiss Cheese with Parmesan for a saltier version, or mix them together! 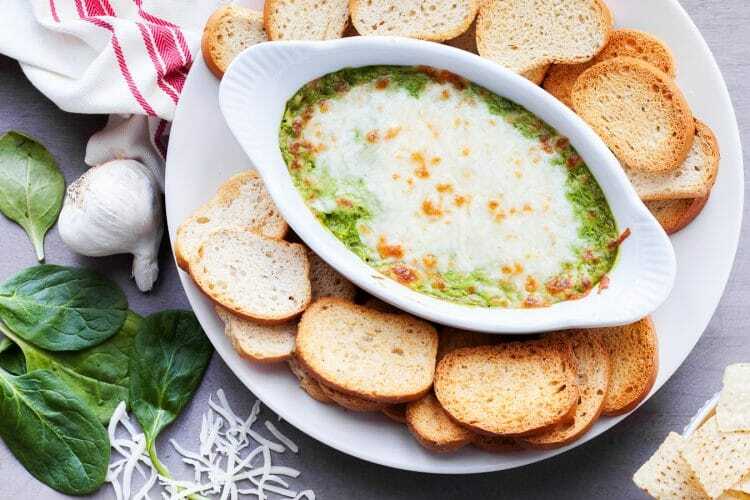 This Baked Spinach Artichoke Dip is a must have for any party, it's loaded with cheese and garlic and the recipe has two different prep methods, you can make it either hearty or creamy! In a medium bowl, combine all ingredients, except for 1/2 cup of shredded cheese. Mix until all ingredients are well blended. Pour into oven-safe dish and sprinkle with remaining 1/2 cup of cheese. Chill for at least 2 hours for flavors to fuse. Bake at 350 F for about 30 - 35 minutes, then bake under the broiler for a couple of minutes until top layer of cheese is completely melted and bubbly. Add all ingredients except 1/2 cup of shredded cheese, in a blender and blend on high until creamy. Bake at 350 F for about 10 minutes, then bake under the broiler for a couple of minutes until top layer of cheese is completely melted and bubbly. 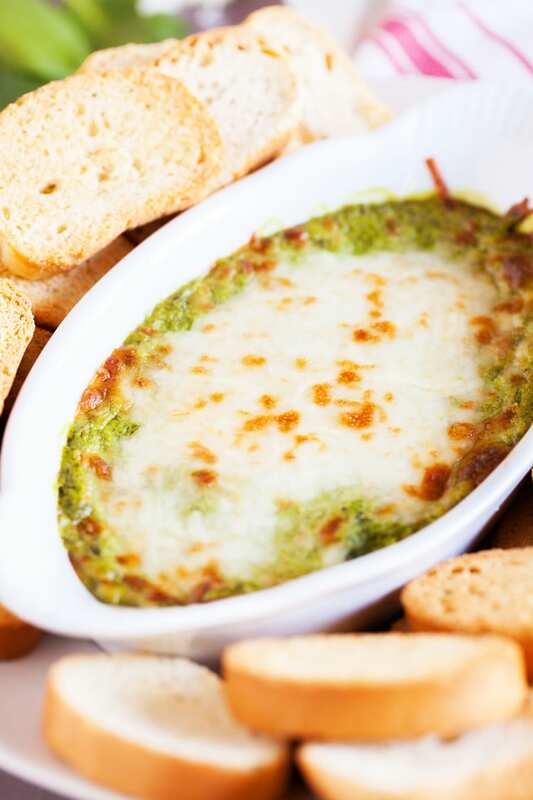 Pin this Spinach Artichoke Dip Recipe! Post was originally published in January 2014. My husband found your recipe for the spinach & artichoke dip in an online search. I used grilled, marinated artichoke hearts but the recipe was perfect and everybody loved it! Thank you! I’m so glad you enjoyed it, Judy! I just pinned it, what a great recipe! I really like how versatile it is. When I am entertaining, I like to but both melba rounds and veggies out so people can have a choice. Nothing like a classic dip to have on hand for all parties throughout the year. This looks delicious…thanks for sharing! Oh yummy! 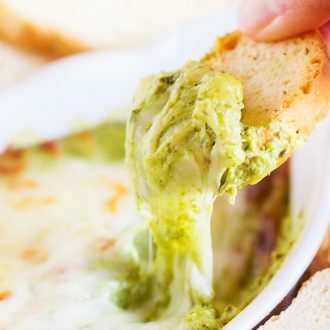 I love a good cheesy dip and this one is a classic! Those salty, savory flavors are perfection! This is my favourite dip. So creamy and comforting and perfect for game day.